See scan - perfect condition. 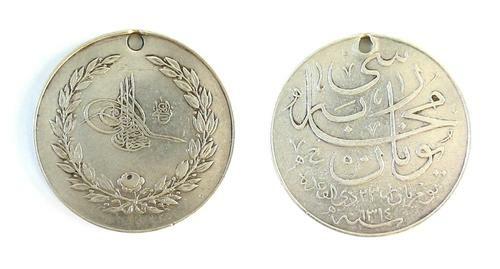 This is a nice and rare Ottoman Turkish silver medal for the War with Greece in 1897. This medal was awarded for the 30 day war with Greece in 1897. After Greece had come within a breath of invading Crete, prevented only by mediation from the Western powers, groups of militant Greeks went to Crete to fight a guerilla war against the Turkish government there. At the same time, another Greek army led by Price Constantine of Greece invaded Turkish territory near Ioannina. This gave the Sultan ample justification for a declaration of war, and a Turkish force from Monastir pushed the Greek force back into Thessaly, where it routed a Greek counterattack and advanced to the Gulf of Volo before the Greeks could put up an adequate defense. At this point the Western powers intervened. The Turks withdrew in exchange for monetary compensation, and were allowed to repatriate some Turkish refugees. The outcome of the campaign served to bolster Abdulhamid's prestige among Ottoman subjects, forestalling the reform movement of the Young Turks. The medal of the Greek war is silver, 24 mm. diameter, worn from a ribbon of four red and three green stripes of equal width. The obverse bears the tughra of Abdulhamid II, surrounded by a laurel wreath, with a distinctive feature: a rose at the bottom of the wreath. The reverse bears the inscription "Greek War Day - Sunday, 23rd of Zildake (11th month of the Hejira calendar), 1314". Approximately 130,000 of these medals were awarded. Nice militaria / military collector piece and one of the rare Ottoman Turkish medals.